All confirmed - took them long enough FFS when everyone else had already leaked it was a done deal with Emery himself even mistakenly announcing it Tuesday night on his website TBH my only thought was thank **** it's not Arteta so hardly excitement at the announcement. What does everyone else think of the appointment? I'm not expecting much if £50m is all that is going to be available to spend this Summer, that's not even one decent player in today's market so what the **** does Gazidis expect for £50m?! Much of the same useless performances next season. I'll be only too happy to be proven wrong! Last edited by An0n0m0us; 23 May 2018 at 02:51 PM. I'm very happy. Just hope we can shift some of the players who aren't good enough. Happy to hear he wants to build around Ramsey and Auba. We need a good keeper more than anything else. Do you agree with the structure then? I am very much old school and believe the manager should have the team he wants and choose the players. I am not happy we have Minislat selecting new signings or any of the other interfering positions Gazidis has installed. Do you see Utd or City telling Jose or Pep they have no say in who they sign?! That's a strong team in my opinion and good enough to get into the top four/win EL if they are coached into a hard working team. I think you are wrong with the signings, they have made it clear it's a head coach role and not a managers role and the signings are purely done by the roles Gazidis has put in place such as Minislat. Arteta wanted involvement with signings and they told him no so he dropped out the running. We certainly need a new GK and 2 x centre backs and a defensive midfielder. We have a stack of attacking midfielders so I don't want to see any more of those signed unless some existing ones are sold off. The front 5 I have no problems with it's the back 6 that are the issue when we used to have the strongest defence in the league. Something Wenger neglected massively over the last 8+ years and we have seriously paid for it. Just think back to the defenders and defensive midfielders we have had and then what we have now. It's shocking. Adams/Bould/Dixon/Winterburn/Lauren/Cole/Sagna/Clichy/Keown/Toure/Campbell/Vermaelen/Vieira/Petit/Gilberto - every one of those was World class at their peak. Not one of our current crop of defenders or defensive midfielders is anywhere near being World class, in fact I would say they would struggle to get into many of the top half of the Premiership teams. The only one that has been in the last few years is Koscielny but even he has now had his time and is nowhere near the player he was. Last edited by An0n0m0us; 26 May 2018 at 12:26 AM. Will be interesting to see if they make any difference as none are big name signings and all got on the cheap in today's market. Torreira is probably the one i'm most happy about as at last we have a defensive midfielder who is strong and with international experience in a decent team. Who would you like to see sold? Iwobi & Welbeck mainly. Ospina is nearly gone already. When fit again Koscielny needs to go. Mustafi if we get a decent offer but I think he loves it arsenal. Ozil also but nobody would pay him what we are so I think we're stuck with him. It'd be great if he proves me wrong but I'm sick of his softness and acting so emotional all the time. I agree but also think Holding/Chambers and Jenkinson are not good enough and should not be at the club. if he sells that's it we are truly fcuked with Kroenke owning the club outright. It was the 1st competitive game of the season so you can’t really look much into it as of yet! The fact is that their business in the transfer window was woeful and it will be another season of ****. The new boy clearly has a lot to do - give him a year and see what happens - Can't be any worse than the last 5 years of Wenger ! I agree it can’t but they really needed 2 world class centre backs to replace the utter **** they have now. Lichsteiner was just a freebie and is well past his prime so was a pointless signing. The only decent signing was the Uruguayan but he is young and needs to be playing with decent players around him so he will suffer playing in front of our back four. With such a joke of a Summer transfer window it shows exactly why those 3 in charge of transfers and contracts were brought in, to spend as little money as possible and be Gazidis’ yes men. I’d like to see a table of club expenditure over the Summer as there can’t be many who spent less than us. With Usmanov throwing the towel in and Kroenke owning 100% of the club it is going to continue to be utter **** for years to come. Mid table mediocrity - co-incidence !!! Quite! 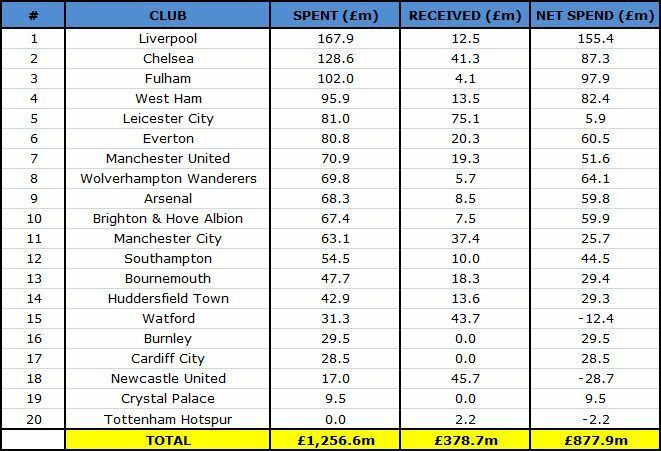 Lol we had the same net spend as Brighton Even Wolves spent more than us.